We’re on the verge of Captain America: Civil War finally being upon us. After months of waiting, and ferociously devouring every bit of footage given to us, we’ll finally be able to see the denizens of the Marvel Cinematic Universe duke it out. Numbers and estimates are starting to roll in for its opening weekend, and it appears like it’s going to absolutely destroy what Batman v Superman: Dawn of Justice brought in. Heroic Hollywood is reporting Captain America: Civil War is likely to accrue a domestic figure of $220 million. This is almost $100 million more than Batman v Superman: Dawn of Justice’s opening weekend, which totalled at $166 million. While both films had substantial hype and fan excitement before their respective release dates, Civil War has a leg up for a few reasons. Although Batman v Superman: Dawn of Justice was essentially the start of the DC Extended Universe, Marvel has been at the game for nearly a decade. Iron Man started the MCU way back in 2008, and it has been only increasing in speed and scope of films. After two phases, audiences know and understand every member of the ensemble cast, and have an interest in the fate of their favorite Avenger. While DC introduced Superman in the somewhat controversial Man of Steel, fans didn’t have the emotional investment in Battfleck and the rest of the characters. Additionally, reviews are surely going to play a big part in box office draws for both films. Batman v Superman met mixed to negative reviews, which likely hindered its opening weekend numbers, and definitely resulted in the steep drop in sales for the following weekends. Captain America: Civil War; however, has been garnering overwhelmingly positive reviews. We here at Cinema Blend gave our own glowing review, which you can check out here. Moviegoers are much more likely to shell out their money on tickets and popcorn if they know that their superhero experience is going to be a positive one. Plus, who doesn’t want to see a gaggle of heroes kicking each others asses? Civil War’s projected numbers have the possibility of breaking a few records. If all goes as planned, the third Captain America flick will beat a fellow MCU movie for the biggest May premiere; 2012’s The Avengers currently holds that record at $207 million. Additionally, if Civil War makes even more than $220 million, it could give Star Wars: The Force Awakens a run for it’s money (literally). The Force Awakens’ opening weekend resulted in Disney raking in a whopping $245 million, so it is fairly close to the projected numbers for Civil War. We’ll continue to update you on all things Marvel as details become public. 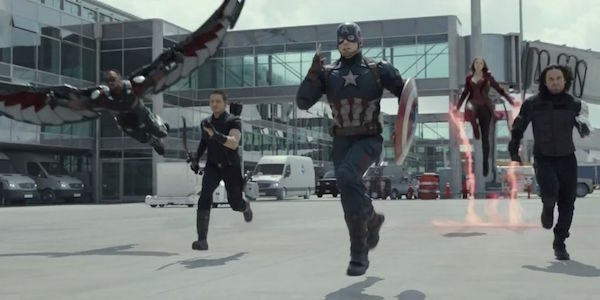 Captain America: Civil War will premiere May 6, 2016.